The Aquila Report has republished an article by Carmen Fowler LaBerge of The Layman Online discussing denominational reformation. In as far as the article emphasizes a return to confessionalism, it's a good article. However, one thing ought to be clarified: When LaBerge lists waves of reformation that have sprouted out of the PCUSA, the following denominations are listed: The Orthodox Presbyterian Church, the Associate Reformed Presbyterian Church, the Presbyterian Church in America, and the Evangelical Presbyterian Church. But, the ARP was never a part of the PCUSA. The Associate Reformed Presbyterian Church split from the Church of Scotland in the 1700s and the Associate Presbyterians in the United States were never a part of the Presbyterian Church USA. You can read more about the history of the ARP here. Below are links to the materials for last Sunday's Adult Sunday School class on the Westminster Confession of Faith at Communion Presbyterian Church. It should be noted that the "Questions" in the lecture notes refer to David Dickson's Truth's Victory Over Error. Materials related to past classes can be accessed by clicking here: Westminster Confession of Faith Sunday School Class. Both large church officers and small church officers are presbyters and should contribute in this way. No false modesty or unbiblical inferiority complex should thwart the vows we all made at our ordination. And the same can be said for ordained seminary professors: it is your church too! Love your fellow presbyters as brothers, but be willing at any point to do the right thing for Christ and the church, even if your best friend thinks differently. The entire article is worth reading, and can be found here: Churchmanship is not penmanship! A. Christ's humiliation after his death consisted in his being buried,1 and continuing in the state of the dead, and under the power of death till the third day;2 which hath been otherwise expressed in these words, He descended into hell. 1 1 Corinthians 15:3-4. For I delivered unto you first of all that which I also received, how that Christ died for our sins according to the scriptures; And that he was buried, and that he rose again the third day according to the scriptures. 2 Psalm 16:10. For thou wilt not leave my soul in hell; neither wilt thou suffer thine Holy One to see corruption. Acts 2:24-27, 31. Whom God hath raised up, having loosed the pains of death: because it was not possible that he should be holden of it. For David speaketh concerning him, I foresaw the Lord always before my face, for he is on my right hand, that I should not be moved: Therefore did my heart rejoice, and my tongue was glad; moreover also my flesh shall rest in hope: Because thou wilt not leave my soul in hell, neither wilt thou suffer thine Holy One to see corruption.... He seeing this before spake of the resurrection of Christ, that his soul was not left in hell, neither his flesh did see corruption. Romans 6:9. Knowing that Christ being raised from the dead dieth no more; death hath no more dominion over him. Matthew 12:40. For as Jonas was three days and three nights in the whale's belly; so shall the Son of man be three days and three nights in the heart of the earth. What is meant by the expression in the Apostles' Creed which Says, "He descended into hell"? This expression has been understood in various ways. Some hold that Christ literally descended into hell, not the hell of the devil and the wicked angels, but a place where the Old Testament saints were thought to be waiting. There, they say, he preached to those spirits and opened the way for them to enter heaven. THis interpretation, which is held by the Roman Catholic Church and by some Protestants, is unsound and is based on a misunderstanding (wrong interpretation) of 1 Peter 3:18-20. Some Protestants hold that the words "He descended into hell" refer to Christ's suffering on the cross, that is, that he descended into hell, not as a place, but as an experience of suffering. While this idea is doctrinally sound, it is historically unwarranted because the word translated "hell" in the Apostles' Creed in not Gehenna (the place of punishment) but Hades (the realm of death). Our catechism teaches that the words "He descended into hell" refer to Christ's being buried, and continuing under the power of death for a time, the word hell being understood as "the realm of the power of death." (pages 112-3). I had a great time at last night's Wednesday Night Bible Study. We had some good questions and discussion. I'm posting my notes from last night, in case anyone would like to have them. As usual, they are based on commentaries by Matthew Henry and Matthew Poole. 2 Cor. 1:12, For our boasting is this: the testimony of our conscience that we conducted ourselves in the world in simplicity and godly sincerity, not with fleshly wisdom but by the grace of God, and more abundantly toward you. Acts 26:20, but declared first to those in Damascus and in Jerusalem, and throughout all the region of Judea, and then to the Gentiles, that they should repent, turn to God, and do works befitting repentance. Acts 5:30, Him God has exalted to His right hand to be Prince and Savior, to give repentance to Israel and forgiveness of sins. Luke 14:26, If anyone comes to Me and does not hate his father and mother, wife and children, brothers and sisters, yes, and his own life also, he cannot be My disciple. Phil. 4:9, The things which you learned and received and heard and saw in me, these do, and the God of peace will be with you. 2 Tim. 4:5, But you be watchful in all things, endure afflictions, do the work of an evangelist, fulfill your ministry. Phil 3:2, Beware of dogs, beware of evil workers, beware of the mutilation! Gal. 5:15, But if you bite and devour one another, beware lest you be consumed by one another! 2 Peter 3:16, as also in all his epistles, speaking in them of these things, in which are some things hard to understand, which untaught and unstable people twist to their own destruction, as they do also the rest of the Scriptures. 2 Tim. 1:15, This you know, that all those in Asia have turned away from me, among whom are Phygellus and Hermogenes. 2 Tim 2:17-18, And their message will spread like cancer. Hymenaeus and Philetus are of this sort, who have strayed concerning the truth, saying that the resurrection is already past; and they overthrow the faith of some. 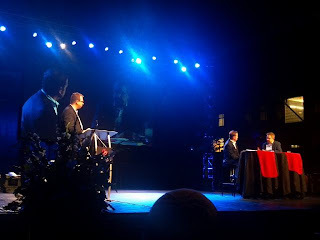 Saturday night, Biola University hosted a discussion (they were careful to not use the word "debate"--and really, it was more of a discussion than a debate) on the topic "For and Against Calvinism." Presenting the Calvinist position was Dr. Michael Horton of Westminster Seminary (and, of course, the White Horse Inn). Presenting the Arminian position was Dr. Roger Olson of George W. Truett Seminary (the seminary of Baylor University) and author of many books, including his latest Against Calvinism (Dr. Horton wrote a companion book, For Calvnism, hence the title of the event). Over all, the evening was very enjoyable, and very educational. It was enjoyable because it was obvious that the two men (who have known each other for 20+ years) had a true friendship and respected each other enough to not misrepresent the other. The format of the discussion was also enjoyable: Dr. Olson began by stating his position; Dr. Horton then stated his. The two men then sat down at a table on the stage and quite literally discussed their respective theologies. It gave the impression of listening in to a friendly conversation two men would have over dinner. After the discussion, questions which had been submitted by the audience via Twitter (the hashtag used was #calconvo if you would like to get an idea of some of the questions) were answered by the two men. The evening was also very educational. Dr. Olson seemed like a very nice man--a man it would be easy to get along with. This was reinforced by his friendly discussion with Dr. Horton, whose own position is very much opposed to Dr. Olson's "on some very important points" (Dr. Olson made that clear near the end of the evening). Dr. Olson also repeatedly pointed out that there is a lot of common ground between Calvinists and Arminians. He even used a lot of the same language Dr. Horton used. For example, Dr. Olson made it clear he believes in the penal substitutionary view of the atonement. He made it clear he believes in election, in God's justice, in His love, etc. Why is all that educational? Because I was reminded that false teachers who come into the church will do so by claiming to believe the very same truths we confess. The difference between the two conversationalists was not the words they used, but the meaning behind those words. Not only was my appreciation for those who have gone before me and faced these false teachings (the Council of Dordt and the Marrow Controversy came to my mind last night) greatly increased, but I also came away with a great appreciation for those in the church today who are combating heresy. The Federal Visionists came to mind as another group who claim to believe the same things we do, and yet attach very different meaning to them. We as Christians, and especially as elders, must be astute enough to see the wolves beneath the sheeps clothing. I truly believe Dr. Olson to be a kind, educated gentlemen based on his interaction with Dr. Horton last night. However, I also believe his doctrine to be so dangerous that it must be opposed and excluded from the Church. One final note: It amazed me how little Scripture Dr. Olson used in his presentation or conversation with Dr. Horton. It was very clear last night that Arminianism comes to Scripture with a preconceived notion of who God is and how He must operate (I saw some tweets that echoed this, so I guess I wasn't the only one that noticed). Dr. Horton, on the other hand, began with Scripture, built up his argument with Scripture, and concluded with Scripture. Dr. Olson even jokingly stated, after Dr. Horton finished his opening presentation and sat down with him at the table, "Nice sermon." Indeed, it was a nice sermon, for it presented the truth of the Gospel: That there is nothing we can do to save ourselves, and we must put all our hope in Christ who has done all that was required of us, and after He had done all that was required, took on the penalty of our sins for us. Salvation is all of God and therefore all glory belongs to Him and Him alone. Soli Deo Gloria! And after the uproar. Paul’s leaving Ephesus is an important turning point in his ministry: after this, he will never again preach where Christ had not already been named, as he had so many times up until now (Romans 15:20, “And so I have made it my aim to preach the gospel, not where Christ was named, lest I should build on another man’s foundation,”). Macedonia. Where Philippi and Thessolonica were located. DISCUSSION QUESTION: WHY DID PAUL TAKE SO MANY MEN WITH HIM, ESPECIALLY MEN WHO WERE HELPING THE CHURCHES IN THOSE AREAS? POSSIBLE ANSWERS: Paul was going to need more help where he was going. He needed the assistance of these able men to build up, strengthen, and teach the Christians and converts he would encounter. the Days of Unleavened Bread. Not because Paul observed these shadows, now that the substance was come (see 1 Cor. 5:7-8, “Therefore purge out the old leaven, that you may be a new lump, since you truly are unleavened. For indeed Christ, our Passover, was sacrificed for us. 8 Therefore let us keep the feast, not with old leaven, nor with the leaven of malice and wickedness, but with the unleavened bread of sincerity and truth.”), but to mark the time of year. Why would Luke tell this to Theopholis? in five days joined them at Troas...stayed seven days. So important was it to Paul to go to Troas, to encourage the Christians there (and perhaps even, to have Luke rejoin him? ), that he was willing to sail for 5 days, for only a weeks stay in the city! continued his message until midnight. Because he had much to tell them, and did not know when, if ever, he should see them again. This is a farewell sermon. upper room. Though the disciples had met in upper rooms before (Acts 1:13, “And when they had entered, they went up into the upper room where they were staying: Peter, James, John, and Andrew; Philip and Thomas; Bartholomew and Matthew; James the son of Alphaeus and Simon the Zealot; and Judas the son of James.”), this is not a stately place to meet. Neither is it convenient, nor, possibly, very comfortable, or even very safe! However, none of those are valid excuse to not be present for the preaching of the Word, and the administration of the Sacraments! When a worship service is set, Christians are obligated to be present. sinking into a deep sleep. Sinking indicates he was fighting to stay awake but was overpowered by it. Though he was wrong to fall asleep during Paul’s sermon, some compassion must be shown for the boy who was up past his bed time and struggling to stay awake to hear more.